It's been quiet here because the computer is still in for repair. There is also change at home which requires lots of early nights and organisation. Not sure how long that will be for so I'm trying to keep a steady pace. Plus a job change in a few weeks for me. This is not say that I am doing nothing. Lucy at Attic24 has a mass of quick and easy patterns that I have been trying out. 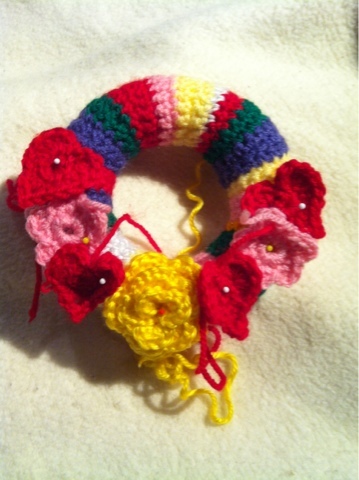 I have totally used her idea and made a hearts and flowers wreath. I think with all the bits that I have made, and its size, it has come out well. I'm hoping to finish it this week and give it to a friend I will be not seeing so much of when I change jobs. I don't think I have ever been so nervous about leaving a job before. Hoping to show you some sewing soon.